I don't know about you, but for some reason my daughter's diapers only seem to leak when she's in her carseat--and, of course, it's especially bad if we happen to be on a road trip. Although I don't know why that is, I do know that I have gotten really tired of disassembling her entire carrier in order to wash it...seriously, can they make those things any more difficult to take apart and put back together? I don't mind quite as much when we're close to home, but when we're on the road somewhere, three hours from our destination and her carseat's a mess...sigh. The last time it happened I kept thinking how it would be so much easier if I had some sort of pad to put underneath her that would absorb the mess, could be switched out quickly, and wouldn't interfere with the carseat straps. Enter this project! 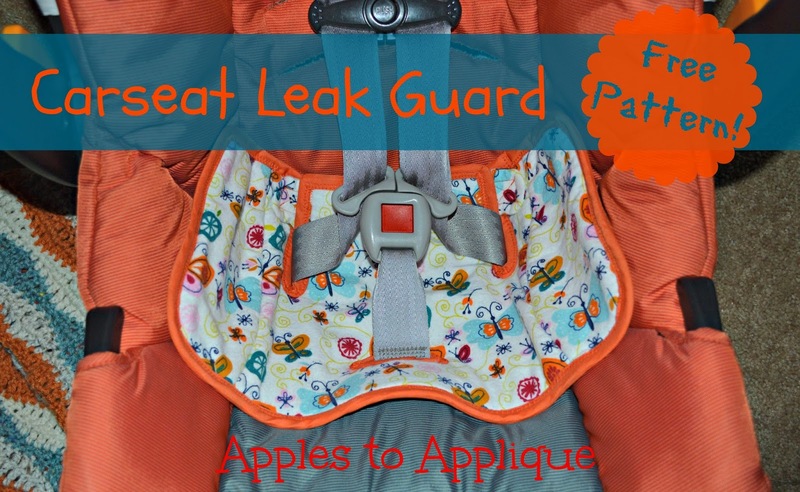 I came up with a leak guard that quickly and easily hooks around the carseat straps and will *hopefully* keep down on the number of times I have to completely disassemble her entire carrier to wash it. 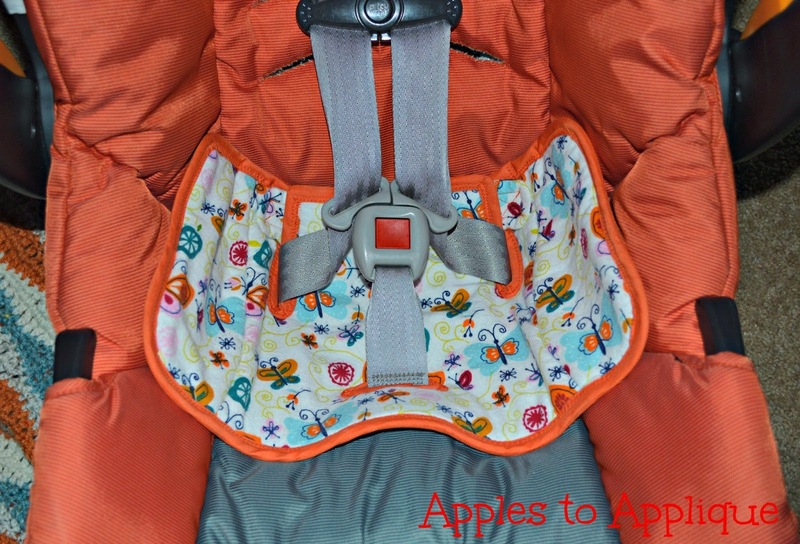 It has a soft layer on top for Baby to sit on, an absorbent layer in the middle to collect the mess, and a waterproof layer on the bottom to keep the carseat clean. After a couple of prototypes and some adjustments, I have finally come up with a pattern I'm happy with and--lucky you--I've decided to offer that pattern here for free! This pattern isn't terribly difficult, but if you don't feel comfortable sewing with seam binding, there's a great class you can take from Craftsy called Sewing on the Edge. The pattern calls for half a yard of each of the fabrics; you need this amount for the length, but you will be able to get two leak guards from a half yard of fabric--yay! *A note on the vinyl upholstery fabric: I got mine in the remnant bin at JoAnn's for 50% off, and it was enough to make several leak guards. Small quantities of upholstery fabric aren't exactly in high demand, so the remnant bin is usually full of options. My local JoAnn's had probably 6 or 7 different pieces of vinyl upholstery in the remnant bin the day I was there. I even found some that color-coordinated with the flannel I had selected! Cut out the pieces as indicated on the pattern. Note that all of the pieces will be cut from the flannel, batting, and vinyl except for the tab pieces, which are cut only from the flannel. Use a permanent marker to transfer dotted lines from pattern to right side of vinyl pieces (don't worry, it won't show on your finished product). Starting at the top, sew the outward-curving edge of flannel and batting side pieces to the flannel/batting center piece. Please note that I have adjusted the pattern since taking the picture above, so that the edges should line up better at the bottom. If you do end up with a little excess, just trim it even. It's not that critical. In the same manner, sew vinyl side pieces to vinyl center piece. Clip the curves on the vinyl section. With wrong sides together, line up the edges and baste the vinyl and flannel sections together to function as one piece. With the vinyl side up, stitch through all three layers around the lines you made with the permanent marker. Sew about 1/8" away from the line. Cut along each of the permanent marker lines. So this is what you're looking at from the right side. Next, you're going to put the seam binding around the edges. I used a zigzag stitch to make it easier to catch the back edge and to make it good and secure. I started at one of the corners, but you can start wherever seems easiest to you. Just curve the seam binding around the entire edge in one piece, including the two slits you just made. The rounded corners are easy enough to bind; the sharp corners are a little trickier, but aren't too bad. Here's how I did it: When approaching a sharp corner, stitch almost to the edge, backstitch, and then take the needle out. Fold the seam binding down along the new edge you will be following, and just let the little bit of excess fabric at the corner fold how it wants to. Resume sewing from there, catching the corner folds as you begin. The bottom of the slit is a little more difficult. I found it helpful as I approached the corner to fold the next edge down so I had more of a straight edge than a V-shape in front of me. Notice how you can see the blue vinyl from the back where I have it folded to straighten out my sewing line. Now, don't sew through that folded-over part, just sew right up to it, backstitch, and take your needle out, much like you did for the sharp corners above. When you get the corner stitched down in a way that you're happy with, just continue on up the other side of the slit, and keep going around the whole outside edge until you're back where you started. I like to tuck the ends of my seam binding under and then overlap my starting place by an inch or so. Next you're going to put some seam binding around the slit you cut in the middle. I will warn you that this is the most difficult part of this project, because you're working on a small area and you have some more of those tricky inside corners. Just take your time and follow the same steps you did for the inside corners along the edge. It's okay if you have to stitch it in fifteen small increments; stick with it and you'll have a nice finish for that edge. Notice mine looks far from perfect, but it is durable enough to withstand me yanking it out of the carseat after a diaper overload. Pat yourself on the back, because the worst part is over, and your leak guard is almost done! With right sides together, sew around the curved edge of your two tabs, leaving the ends open. Turn the tabs inside out. Tuck the raw edges in and stitch closed. Sew a 1" length of the hook side of your hook and loop tape to each of the tabs. I like to sew a square with an X through it for this part. 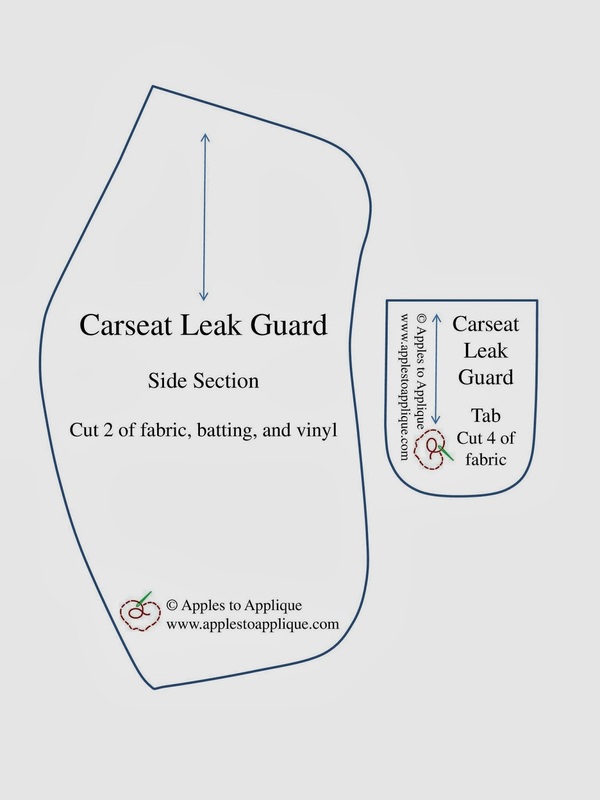 Sew a 1" length of the loop tape to the leak guard at both places indicated on the pattern. It should just nestle right up to the corner of the seam binding. 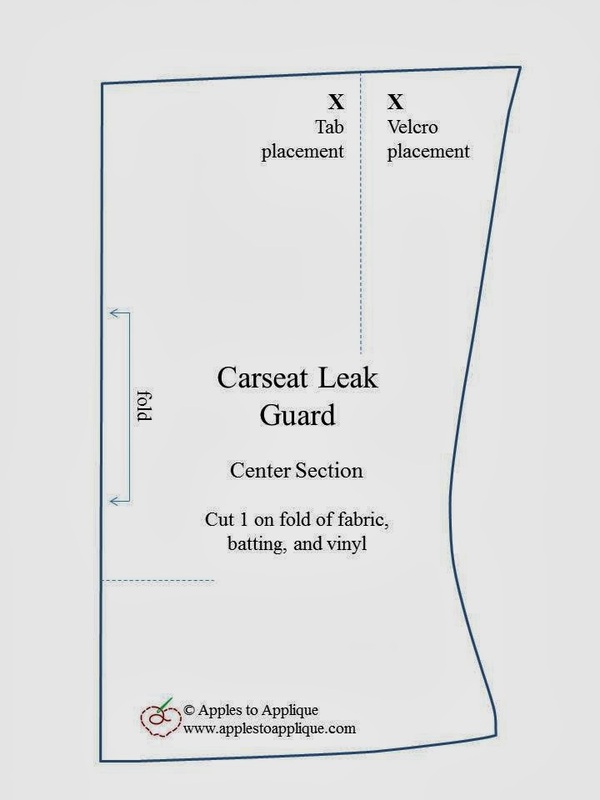 On the vinyl side of leak guard, line up the tab where indicated on the pattern so that the straight edge just lines up with the edge of the seam binding. Make sure the hook tape is facing down when looking at the leak guard from the flannel side. Use a zigzag stitch to secure in place. Repeat with the second tab. And with that, your leak guard is done! To use, slide the buckle through the slit at the bottom, and fasten the tabs around the straps. I went ahead and made two, that way I can have a spare in my diaper bag if I'm on the road somewhere and the first one gets dirty. I love that I can swap out a dirty one for a clean one in less than a minute and then just throw the dirty one in the wash. It is so much better than taking the entire carseat apart! I think this would make a nice gift for a new mom. It's one of those practical things that just makes life easier. Right-click on the images below to download the pattern. There are just two pages, and each one can be printed out on a standard-size piece of paper. Please do not copy or sell the pattern; send people to my blog if they would like a copy. Please feel free to use this pattern to make items for yourself, as gifts, or to sell in small quantities (such as an Etsy shop). All I ask is that you credit Apples to Applique for the pattern, and link back to this post if you post your finished product online. Thank you! Linking up with Take-a-Look Tuesday, Turn-it-Up Tuesday, The Wednesday Roundup, and Worthwhile Wednesdays. This is such a great idea! I can't believe you are handing this pattern out for free! I would love to try this sometime, although it does look a little scary! :) Your tutorial is awesome! Pinning! I'm so glad you commented on my blog so I could find you. Can't wait to look around your site some more! Have a great day! Thanks Gina! I know how much I appreciate finding free resources, so I try to offer them from time to time. ;) If you try making one of these, let me know how it goes! Thanks for stopping by! Super cute pattern! I'm not sure I could create something like this from scratch! Impressive! What about using a vinyl tablecloth instead of upholstery fabric? I think I will try iron on vinyl over fabric.